When all actions are the result of the Gods we need to see where the line in our understanding of the brain, the mind, our culture together with the fact that we are the most psychological creatures on the face of the planet needs to be drawn. This would be the line of demarcation between the facts of our world and the accumulated knowledge of that over the most enlightened period in human history - the line between quantum laws, thermodynamics, accumulated facts and the scientific process versus the supernatural led by Francis the failure on child sexual abuse following on from Benedict the failure on child sexual abuse and reality. 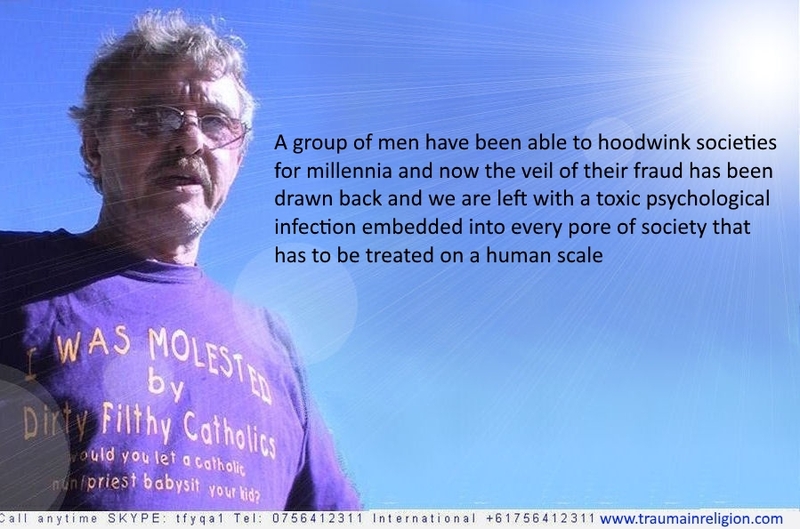 A group of men have been able to hoodwink societies for millennia and now the veil of their fraud has been drawn back and we are left with a toxic psychological infection embedded into every pore of society that has to be treated on a human scale (Human Rights rather than religion Rights) rather than on these social failures relying on traditional forms of power and control over people. A legal system that has limited ability to incorporate the knowledge of science -( inclusions are piecemeal when in fact the law should be current with technology and data) in a ritualized war zone only because our frame of reference is the Christian one that gave us an adversarial system overwhelmingly biased towards those who have been fortunate in life while building barriers against the survival and productivity and inclusion in life - layer upon layer laid down as law based on hundreds of years of social fraud in the hands of kings, gods and religious men and those who use these things to take advantage of the vulnerable as this open secret continues to profit some at an inhumane cost to others.